We are glad to announce that we have released a major upgrade to our productivity application Blast. As part of the upgrade we’ve decided to change its name. So please welcome Trickster. Trickster takes the best ideas of Blast, wraps them in a new shiny package, adds the most requested features from our customers and add some tricks of its own. Specifically, Trickster improves over Blast with more control over the files and folders that you track, greatly improves performance, adds the much requested ability to quickly find the files by typing their name, all this in an improved, slicker UI. You can get more details about how Trickster improves over Blast here. You can take a look at the video below to see some of the changes. Trickster is available both on the Mac App Store and directly from us. Until June 18 it is also available as part of the Productive Macs bundle, which should also check out. You can also download a 14 day trial from our website. We’re sure you’re going to love it. Also, don’t forget to follow @tricksterapp on Twitter where we will publish tips about how to get the most out of Trickster. Important bug fixes in this version. Everyone is encouraged to update. It was also submitted to the Mac App Store, so will be there within a week, most probably. Fixed: sometimes the file that was shown as selected was not the one that was operated upon. Save recent files list every minute for better persistence in case of abnormal exit from the application. Fixed: the excluded items list was sometimes not persisted between launches. Update from within Blast, or download from Blast download page. Following recently added support for sending files to Evernote right from Blast, it is now featured on Evernote Trunk – the listing of applications that interoperate with Evernote. 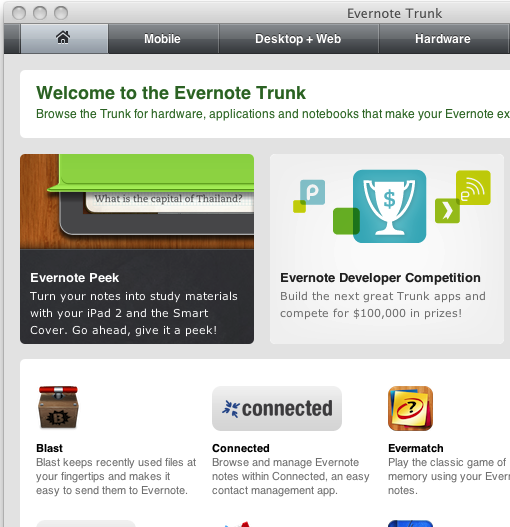 Currently it’s right below Evernote Peek! Blast now allows sending files to Evernote with one click – Cmd-E to send currently selected file to Evernote’s default notebook. One can also right click on a file and send the file to any other Evernote notebook from the pop-up menu. Evernote application for Mac is required to be running on the Mac for this to work. Fresh from the stove, Blast 1.7.3 (not yet on the Mac App Store). This release fixes some important bugs and introduces some new features and changes. Read the details. Dragging a file out of Blast window will close the window to allow access to space below it. It’s now possible to drag a file from Finder to Blast’s icon in the menu. When the file is over Blast’s icon, the window will open and will allow you to move the file to the Sidebar for easy later access to it. Change: Dragging icons from the sidebar now acts like dragging from recent list – i.e. you can drag them to drop in other applications. To remove an item from sidebar, select it and either press Delete/Backspace or use right-click menu. Applications that are on the sidebar can now be used to open recent files. Just put the application on the sidebar and later drag a file from recent list on to the application to open it with this specific application. It’s also still possible to drag files onto folders in the sidebar to move them to these folders. The applications on the sidebar are now also always added to Open With… menu item for recent files, on the bottom, after a separator. Last used view (filter) is now saved between launches. Blast will open on the same view as it was closed. FIX: Improved performance. Occasionally Blast used a lot of CPU for periods of time, causing slow OS operation. FIX. In 1.7.1 it was impossible to drag files from Recent list to side bar. FIX (not in 1.7.2 on Mac App Store): Blast window will now always open below the icon. Previously, when switching to lower-resolution display, Blast window might appear incorrectly on screen, making it unusable. Update from within Blast, App Store or download from Blast download page.